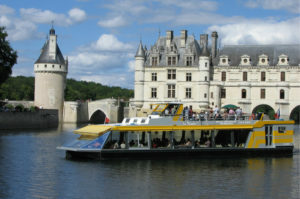 On board of our restaurant boat LA BELANDRE, come and discover Le Château de Chenonceau in another way. Our boat has a 120 places capacity for the strolls and a 100 places capacity for the restauration. A live commentary is said on board by our guide. 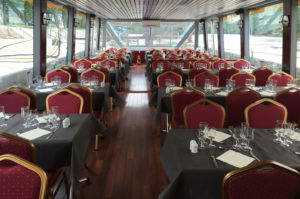 Our restaurant boat, La Bélandre, welcomes you on the river Cher from Chisseaux. – Private cruise for every business or family events. (in Coudekerque Branche) in 1988. LA BELANDRE is the typical name of a trading boat style, with a low draft. Departures are guaranteed for a minimum of 25 passengers. Due to events or reasons out of our control (roadworks, flood, navigation conditions), cruises might be modified or canceled. VAT applied on the cruise date. Our prices and Menus, as well as their composition will be maintained as far as possible, subject to availability of products. Bookings will be definitive as soon as we received the deposit : 50 % of the planned expenditure. Payment at the order of La Bélandre. Participants number must be confirmed 15 days before departure. Final number have to be confirmed 4 days before the cruise. If not, maximum number will be invoiced. If the cruise is canceled, only the refund of the amounts paid will be possible, without any other indemnity. For technical reasons, credit cards aren't accepted onboard. Group prices work for groups of 25+. The composition of the menu will be the same for the whole group, as well as for other groups onboard. Any additional drink will be invoiced and will have to be paid onboard (except credit card). One gratuity for each 25 bookings, two for 50, three for 75.